There�s trouble in Bear Valley. Carla Adrian, played by the luscious Barbara Eden (I Dream of Jeannie), gets her blouse ripped by a wheelchair-bound water-skier who gets fresh. Later, when the masher is found shot dead, Adrian�s mother, Belle (Sylvia Field, a.k.a. Mrs. Wilson on Dennis the Menace), is arrested for the crime. Luckily for her, Perry is vacationing nearby. Watch Perry literally strong-arming his elderly client in an effort to have her come clean. Paul Fix, better known as Marshal Micah Torrence on The Rifleman, makes the first of his several appearances on the Mason series portraying the �typical� backwoods prosecutor. 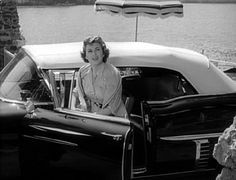 As Della is driving the Cadillac to Perry's cabin, near the beginning of the episode, "Park Avenue Beat" theme song by Fred Steiner is liltingly playing in the key of E-flat, I think. As far as I can recall this is the only episode that presents this theme in quite this gentle way, and, on stringed instruments, I might add. Della is driving slowly beside the lake and tree leaves are gently rustling. CARS: 1957 Cadillac convertible, black w/ black & white int., white top up (Mason), 1957 Pontiac 2-dr hardtop, medium color. From The Cars by Greg Cockerill. + Marion Keats drives a 1957 Pontiac Star Chief 2-dr hardtop. Submitted by oldgray on 3/8/14. Continuity: In one courtroom scene, Della is not seated at the defense table. Three seconds later, she is! The next time we see the table, she�s gone but soon is seen entering through the courtroom door. See here. Submitted by Leah, 7/22/2002. Uncredited Actors: Jamie Forster plays the judge but is not credited even though he is quite involved in the action and has many lines. Submitted by daveb, date unknown. Dorothy Adams, here playing Betsy Burris, also played uncredited Bessie Clary, Laura's maid in the movie Laura in 1944. There is a similar plot point between this episode and the movie: bottles and glasses were washed of fingerprint evidence at the crime scene before the police arrive. 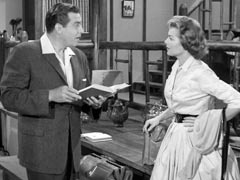 In the movie, the maid washed the liquor bottles and glasses in order to protect Laura's reputation; in this episode, the bottles and glasses were washed by the defendant trying to protect her daughter. jfh 30Apr2018. Location: The opening set-up shot of the lake is identical to the opening shot of #26, TCOT Half-Wakened Wife. Not only is the house on the hill the same, but the boats at the lake shore are in the same positions. Submitted by Charles Richmond, 10/24/08. Vidcap here. + Charles Richmond is correct in his 10/24/08 post about the lake in this episode being the same as #26. Most of the exteriors here are on or around Malibou Lake and is featured in quite a few episodes. It was popular with the Hollywood set and remains basically the same as pictured here 50 years later. Submitted by Eric Cooper 28 October 10. Location: The area of the lakeside cottage Perry stayed at in this episode was reused in TCOT Watery Witness. Della drives Perry's Cadillac to the cottage. When she arrives note the pylon (lightpost?) near the water with the curious top that reminds one of a lighthouse and also the surrounding low wall. In Watery Witness, when Perry and Della talk with Raeburn waterside, the same pylon is very much in evidence. So the site was reused. Submitted by billp 3 June 2011. + The cottage/cabin also turns up in �TCOT Angry Dead Man.� Submitted by billp, 9 June 2011. William Boyett makes his first of eight appearances here on Perry playing the motor cop. In most of his eight appearances he would appear as a member of law enforcement. Seems only fitting since his most memorable role was as policeman Ken Williams for 64 episodes in the classic TV show Highway Patrol. Submitted by PaulDrake 33, 28 August 2009. The (shooting?) script for this episode is dated 5 July 1957. At least 10 other episodes had earlier dated scripts. It seems possible then that this was no earlier than the 11th episode filmed. It was the 7th episode broadcast. It would be interesting to view the episodes in sequence according the these putative dates filmed to look for episode to episode consistencies in cars, sets and what-not. Submitted by billp, 4 November 2009. Addison Richards, playing Atty. George Lansing in this episode, also played Judge Markham in TCOT Howling Dog (1934). Submitted by billp, 27 August 2010. Glovebox Guns: Carla Adrian�s gun is stolen from her glove compartment, to be used as the murder weapon. This is the 3rd time in 7 episodes that this has happened! Submitted by evelyne, 2/7/2011. + The murder weapon was a Colt Police Positive. The sheriff carries a holstered Colt Official Police (could be a Police Positive though). Submitted by oldgray on 3/8/14. Sightings: Little Old Lady #2 appears as the court stenographer today. Submitted by evelyne, 2/7/2011. Set: That cowhide chair that Carla Adrian sits in at Mark Cushings' also turns up in TCOT Lonely Heiress. It's in the cabin where Perry interviews Marilyn Clark along with her step-brother, George Moore, right before Marilyn surrenders to the police. Submitted by billp, June 15, 2011. The syndicated print shown recently had the Filmed by TCF Productions credit with the law books background removed and replaced with the later Perry Mason - A Filmed Presentation - A CBS Television Network Production with the Lady Justice background tacked on. Submitted by Wiseguy70005, 7/28/12. Syndicated cuts: Della arriving at Perry's cottage with Paul there, both being asked to get license plate numbers of every car there and Della getting breakfast; Hale introduces himself to Mason; conversation between Hazel and Betsy; Betsy at Hale's office with the sheriff; Marion is pulled over by cop who tries to match her fingerprint with the one found on Carla's car. Additional Hallmark cuts: Mason draws a diagram of the cottages, car and tracks with the sheriff's help; Hale asking Betsy on the stand what she saw (broken window, broken glass, table, some of the room and wheelchair) and heard (scream, but she doesn't know who); Lansing telling the judge there is nothing Mason can elicit from Marion and in forcing her to appear exposes her to publicity to create diversion and distract attention from the defendant. Submitted by Wiseguy70005, 7/28/12. Perry asks the operator to call Paul Drake at CRestview 9-7441. Submitted by MikeM, 10/7/2012. The "suspenseful" (according to the closed-captioning) stock music from the CBS Music Library heard at the beginning of Act 1 with Sam Burris waking up his wife can be heard on The Twilight Zone, especially in the episode "Mirror Image" broadcast 2/26/60. Submitted by Wiseguy70005, 12/8/13. When Paul Drake operative Henderson reports on Marion Keats he says she is 5'7", 123 lbs. and aged 25. Her driver's license states 5'3", 115 lbs and birthdate 4/9/33 which at the time of filming and airdate would make her 24. Submitted by Wiseguy70005, 12/8/13. When DA Hale introduces himself to Perry he states his first name as "Darwin" (as in the novel), but when the sheriff brings Betsy Burris to Hale's office she calls him "Bill." Submitted by Wiseguy70005, 12/8/13. Closed-Captioning: When the sheriff is speaking to Carla at her cabin and calls her "Miss Carla," the closed-captioning displays the line as "Ms. Carla." I don't believe Ms. was used back in 1957. When Paul Drake mentions Marion Keats' address the closed-captioning spells the street as "Rossmore" but on the driver's license it is spelled "Rossmor." Submitted by Wiseguy70005, 12/8/13. Sponsored Items: I just watched this episode on MeTV and was surprised to see the pictures of FOUR sponsored items show up during the closing credits. Unfortunately, they were NOT actually listed/named like "Prell" was pictured AND listed in episode 240's credits (on MeTV). I could not figure out the First one shown. It displayed the product box and next to it what looked to be a round dinner roll, or possibly a "pot pie", as it seemed to have its outside border "crimped" all around (maybe fork marks?). The Second was "New Blue Dutch Cleanser". The Third was "trend" (with a lower case "T"). The Fourth was "Beads-O'-Bleach" (not the famous SNL's Bag-O'-Glass, LOL!). Can anyone figure out the First one? ;-> Thanks in advance! Submitted by mesave31, 03/30/15. +That's Sweetheart Soap (yes, the picture is a bar of soap). I'm surprised to hear that MeTV shows the original closing but I did notice the Prell Shampoo at the end of episode 240 in the syndicated version (which may or not be the same version MeTV shows). Submitted by Wiseguy70005, 4/14/15. ++ WOW, thanks for both of your feedback! To me, it almost looked like a "G" as in the word "Gourmet" and the second word looks like "burger", but that bun thing is no way a "burger"! ;-> Sweetheart Soap?! I NEVER would have guessed that!!! Thanks! BTW, episode 21 Green-eyed Sister has the same four sponsored items, watching MeTV. So far on MeTV I've only seen these on episodes 7, 21, and 240, but I'm watching! ;-> Submitted by mesave31, 04/19/15. +++ On episode #23, I WAS ABLE to see that the FIRST one was actually "Sweetheart Soap", as you helpfully provided. The picture and lettering were VERY clear in that one...YAY! ;-> Thanks again! Submitted by mesave31, 04/21/15. + From what I understand, Perry Mason, being the first hour-long series with continuing characters, had trouble getting a sponsor. Finally, Purex, the makers of the cleaning products shown, agreed to sponsor every other episode. So, their products are on the odd-numbered episodes from episode 1 through 25 (don't know if MeTV has all of these versions). Some sponsors dropped out midway through the season and Purex may have as well since the sponsor products disappear after that. Also, episodes 13 (the pilot episode) and 19 do not have the sponsor products but instead of the large law books seen in the even-numbered episodes, smaller books are shown in the corner in place of the products with the credits still shown with the lower-left corner "blank." It is unclear whether the sponsor products were planned when the credits were made and were changed or whether the sponsors were originally shown but that footage was unusable and was replaced by the rerun/syndicated credits. More alternating sponsors can be seen in the third season but these are different from episode to episode and not exactly on an alternating week schedule. The books also change throughout the first season: even-numbered episodes 2-14 have one set while even-numbered episodes 16-24 have another. After the sponsor products disappear all episodes 26-39 have a third set of books-the ones seen in the earlier episodes 13 and 19 but now shown large to fill the screen. Submitted by Wiseguy70005, 4/21/15. This is the only time you hear the �romantic� version of the Perry Mason theme as Della drives Mason�s car up to the lake cabin he�s �roughing it� in. It comes equipped with three bathrooms and Paul Drake at the fridge. Submitted by Dedra Kaye, 3/21/08. + Not quite: we get a few notes of it in the next lakeside-set show, TCOT Half-Wakened Wife. Added by Notcom, 081516. I remember William Boyett from his run (119 episodes) in the Adam-12 series as Sgt. MacDonald. Submitted by daveb, 8/28/09. This is an unusually straightforward adaptation of the novel. Simplified, of course, to fit the allowed time, it features most of the same plot points with the same defendant, victim and murderer; and most of the characters have the same or similar names (Carla/Carlotta, e.g.) as in the novel, including Darwin Hale, George Lansing, Bert Elmore and even the gossiping Hazel (so why was Arthur changed to Mark?). Much of the dialogue in the courtroom comes from the novel as well. About the only differences were that in the novel Harvey Delano was also Carlotta/Carla's lawyer and Betsy Burris was described as "heavyweight" and having "waddled her way to the witness stand." Submitted by Wiseguy70005, 12/8/13. Objection! This episode contains the first occurrence of the classic "That's irrelevant, incompetent, and immaterial!" objection. Submitted by 65tosspowertrap, 3/16/2014. Another episode wherein Perry lights a cigarette but stubs it out without smoking it. It happens in his cabin at his first meeting with Belle Adrian. jfh 30Apr2018. The presence of Joan Weldon and Barbara Eden makes this one of the more pleasant PM viewing experiences, right up there with TCOT Envious Editor, #108 (with Barbara Lawrence and Sara Shane) and any episode that includes Lisa Gaye. Submitted by BobH, 27 January 2018. Norah Fleming's breathy performance on the witness stand reminds me of Jane Russell on the witness stand in the penultimate scene of "Gentlemen Prefer Blondes". Although thoroughly entertaining, this episode has amongst the least surprising resolutions: Bert is the next door neighbor and admits he wouldn't mind seeing the victim dead...but the audience is (perhaps) fooled by a clever ruse: when confronted, he just flat out lies !! Notcom 050517.